Preheat oven to 425F. Use tomatoes held at room temperature until fully ripe. Core and slice tomatoes; cut each slice in half. Place pitas on 2 baking sheets; brush with oil. Arrange tomato slices on each pita, dividing evenly. Sprinkle with Parmesan cheese and half of the Italian seasoning. Bake until tomatoes are heated and pitas begin to crisp, about 10 minutes. Sprinkle tomatoes with half of the mozzarella cheese. Top with zucchini, green pepper and onion. Sprinkle with remaining mozzarella and Italian seasoning. 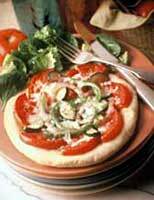 Bake until cheese is melted and vegetables are crisp-tender, about 10 minutes. Serve with crushed red pepper, and additional Parmesan cheese, if desired.